A visit to his local beach will never be the same again for Philip Mullaly. 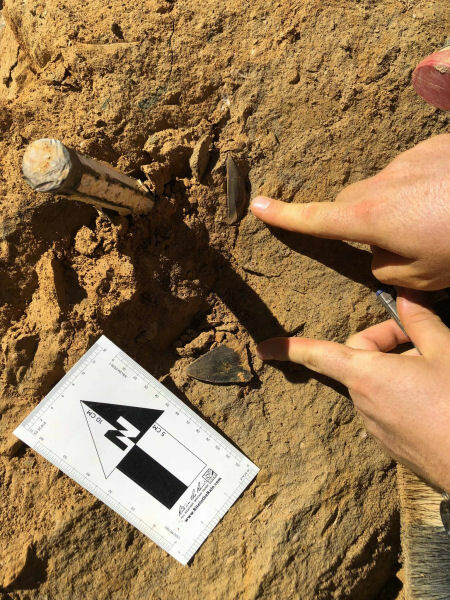 The keen-eyed fossil enthusiast has found an extraordinary set of shark teeth - evidence that a shark nearly twice the size of a Great White once stalked Australia’s ancient oceans. 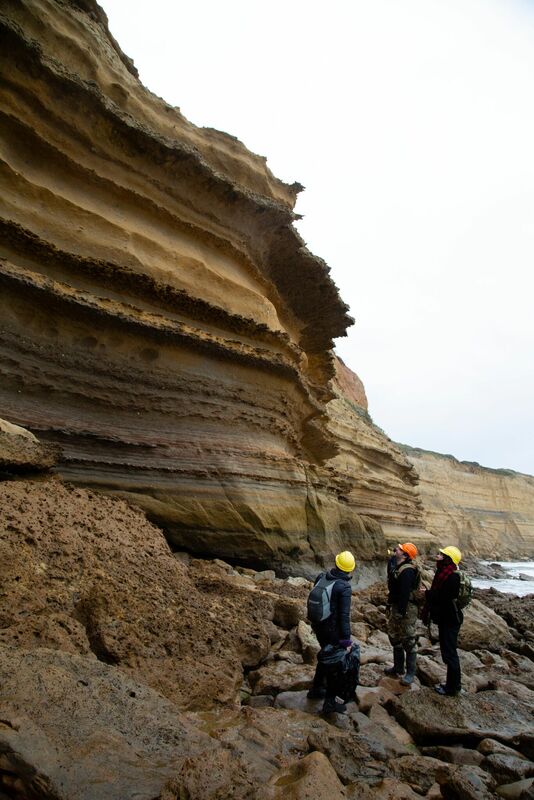 The citizen scientist made the find in Jan Juc, a renowned fossil site along Victoria’s Surf Coast. “I was walking along the beach looking for fossils, turned and saw this shining glint in a boulder and saw a quarter of the tooth exposed. I was immediately excited, it was just perfect and I knew it was an important find that needed to be shared with people,” recounts Mr Mullaly. 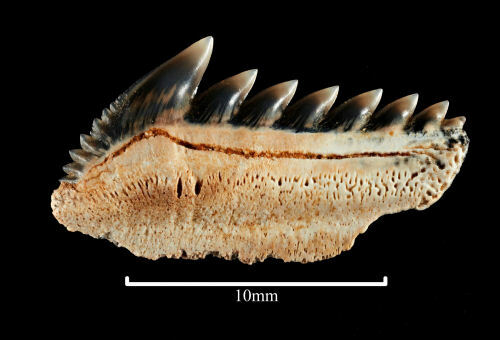 Up to 7 cm long, the teeth have been identified as being from an extinct species of mega-toothed shark - the Great Jagged Narrow-Toothed Shark (Carcharocles angustidens) - which could grow to more than 9-metres long, almost twice the length of today’s Great White Shark. 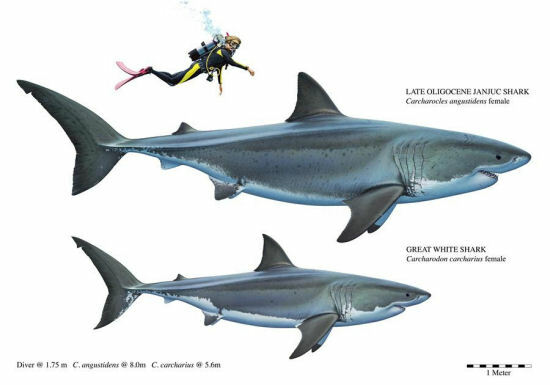 This shark stalked Victoria’s ancient sea approximately 25 million years ago, during the late Oligocene epoch. It was the top predator and would have preyed on small whales. 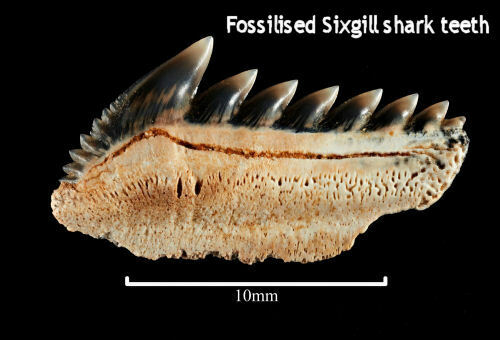 Recognising the significance of the discovery, Mr Mullaly contacted Dr Erich Fitzgerald, Senior Curator of Vertebrate Palaeontology at Museums Victoria with an offer to donate the teeth to Museums Victoria’s collection, an offer gratefully accepted. 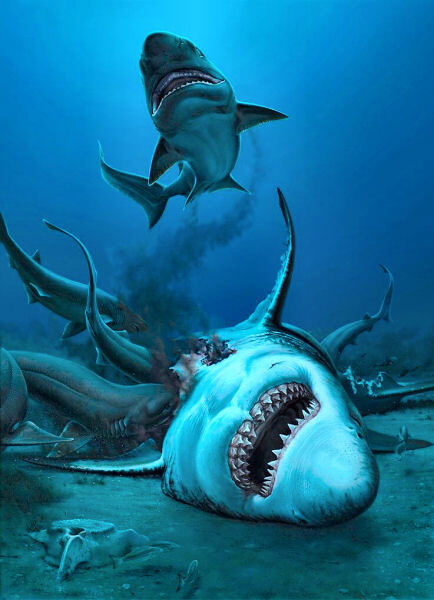 Almost all fossils of sharks worldwide are just single teeth, so it is extremely rare to find multiple associated teeth from the same shark. This is because sharks, who have the ability to regrow teeth - lose up to a tooth a day. Cartilage, the material a shark skeleton is made of, does not readily fossilise. “These teeth are of international significance, as they represent one of just three associated groupings of Carcharocles angustidens teeth in the world, and the very first set to ever be discovered in Australia,” Dr Fitzgerald explains. Realising Mr Mullaly's haul was all from the same species, Dr Fitzgerald suspected that the teeth came from one individual shark and there might be more teeth still entombed in the rock at Jan Juc. 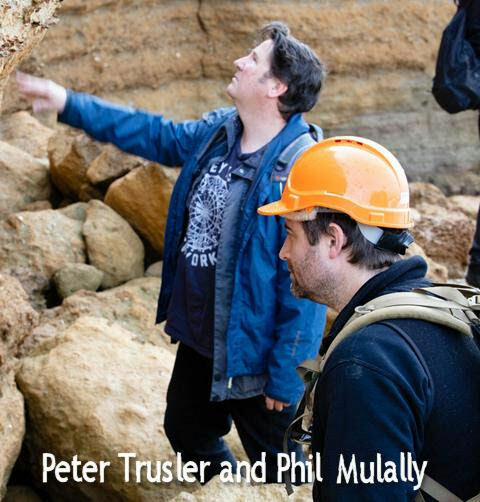 So, in December 2017 and January 2018, Dr Fitzgerald led a team of Museums Victoria palaeontologists, volunteers, associates and Mr. Mullaly on two expeditions to excavate the site. Battling summer heat, and with only a tiny window each day to access the site at low tide, the team dug out the entire boulder, collecting more than 40 teeth. In the boulder, were several teeth of a smaller shark, the Sixgill Shark (Hexanchus). According to Museums Victoria palaeontologist Tim Ziegler, these came from several different individuals and would have become detached from their jaws as they were scavenging on the huge carcass of the Carcharocles angustidens after it died. “The teeth of the sixgill shark work like a crosscut saw, and tore into the Carcharocles angustidens like loggers felling a tree. The stench of blood and decaying flesh would have drawn scavengers from far around. This new discovery cements Jan Juc as one of Australia’s most important fossil sites, as it continues to provide us with unique insights into the deep history of Australia’s marine life including whales, dolphins, sharks and countless smaller marine animals. The general public will have a rare and limited opportunity to see these incredible teeth specimens when they go on display at Melbourne Museum as part of National Science Week on Thursday 9 August. The display will be open until Sunday 7 October. 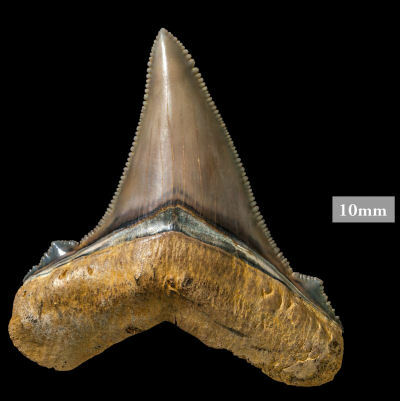 The Mega Shark Fossil Find display will feature all 45 fossil shark teeth, as well as state-of-the-art life-sized 8-metre long digital animation which will appear to swim around the gallery floor surrounding the showcase. For National Science Week, Melbourne Museum has programmed a suite of palaeontology events, including fossil identifications, Jurassic Park 3D in IMAX (18 Aug), (19 Aug) and The Giants of Palaeontology talk with Dr Fitzgerald and fellow Museums Victoria palaeontologist Dr Tom Rich (19 Aug). The Mega Shark Fossil Find opens to the public as part of National Science Week on Thursday 9 August, and will run until Sunday 7 October. Museums Victoria’s field research at Jan Juc is carried out with the support of the Department of Environment, Land, Water and Planning, Surf Coast Shire Council and the Great Ocean Road Coast Committee. This is an announcement for the Inaugural BESSI & MESAC Fossil Exposition. Have you ever been intrigued by fossils ... and the fact that we have them on our doorstep at Ricketts Point? Would you like to meet the experts? You are invited to the Beaumaris Yacht Club, Beach Road, Beaumaris, VIC, 3193. Sunday 26th August 2018, from 9.30 am to 2.30pm. Bring along any fossils you have that you would like identified. 10.00 AM Talk by Richard Casley - "A Collector's Experiences."